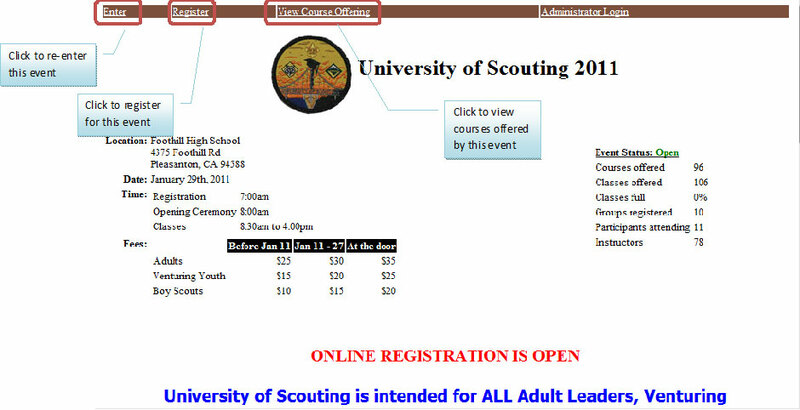 Before you can register to attend an event you will first need to register as an InteliScout user. 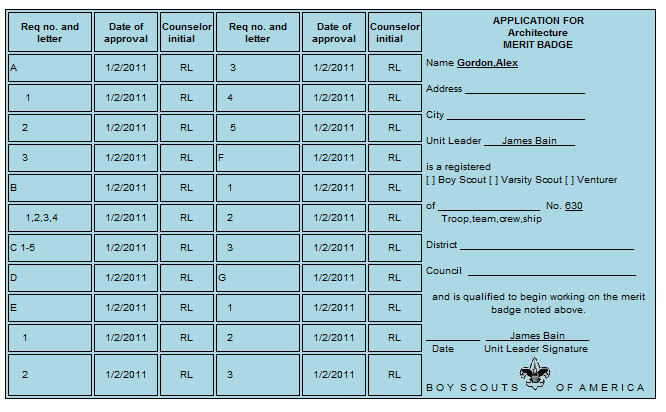 Once you log in as a registered InteliScout user you will be shown a list of events in your council. You can also add a watch council to your personal settings to see the events of another council near you. Important note: Make sure that you select the correct council as your home council. If you are not sure which council you are in, ask an experienced Scouter. 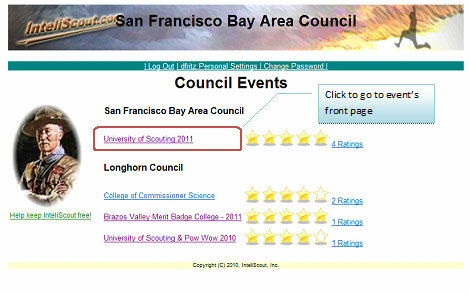 Selecting the wrong council will cause the wrong events to be listed for you when you log into InteliScout. Important note: Make sure that InteliScout.com is listed as a safe sender in your SPAM filter. If you do not receive the email with your user name and password within a few minutes, check the junk folder of your email client. If you find it there, please select it as mark it as being sent by a safe sender. This will allow you to receive important emails about the events you sign up for. Important note: InteliScout does not allow anyone under the age of 14 to register in compliance with federal law. If you would like your son to attend an event then please register yourself as the contact person or work through your Den, Pack or Troop leader to sign your son up for an event. After successfully logging into InteliScout.com you will be directed to the events occurring in your area. From there it's just a click to the site of the event you would like to attend. Once you have registered as an InteliScout member and logged in using your user name and password you will be passed to the Events page for the council you designated as your home council during the registration process. Your home council and contact information can be changed at any time by clicking the Personal Settings link at the top of the Council Events page. You can change your InteliScout password by clicking the Change Password link. Often neighboring councils will host an event on InteliScout that you may want to attend. You can have these events listed in your Council Events Page by adding another council as a Watch Council. This is done by clicking the Personal Settings link and selecting the council to watch. To remove a watch council choose the Select... option. When an event is created by an Event Administrator, he/she may decide to make it a "by invitation only" event to better control the size of the event or make sure that every unit participating supplies instructors, for example. When you try to enter such an event the you will be asked for your event User/Unit Name and Password. If you do not have these then contact the Event Administrator whose email address should be provided on the event's information page. Other events are open to anyone. For these events, you can use your existing InteliScout registration user name and password, or make up something that is event specific. If you are a contact person for a group, such as several leaders from the same den attending University of Scouting together, then you should make up an event User Name and Password that you don't mind sharing with the rest of your group. For example, it probably wouldn't be a good idea to use the same user name and password that you use for your online banking. While InteliScout strongly suggests that each unit, den, pack, troop, team, crew, etc. appoint a single contact person that represents a group of one or more participants, we recognize that sometimes this may not be desirable. A good example is Merit Badge College where the Scoutmaster prefers to have each scout's parents sign their son up individually. In cases like this, much confusion can be avoided if you create an Event User Name that is derived from your unit number and your last name. For example, Troop911-Smith would be a good choice. That way, everyone from Troop 911 can have their own unique Event User Name while allowing the Event Administrator to quickly determine who from Troop 911 will be attending. To register for an event, click the link of the event from your InteliScout Council Home page. After entering your event's front page, click the Register Link at the top of the page to register. In the future, simply click the Enter link to re-enter the event. Most events have fees to cover the costs associated with running the event. These fees are determined by the Event Administrator, and there may be any number of types of fees. There may be fees for taking certain classes to cover materials, there may be fees for non-instructor adults to attend that would like a patch. The Event Administrator should spell this out clearly in the information page of the event site. InteliScout allows for fees to be paid in one of two ways. First, you can pay online using a credit card unless this feature is disabled by the Event Administrator. If this is the payment method you choose then everything is recorded automatically and there is little room for error. Also, the date and time of your payment is recorded and an email sent to the Event Administrator so that proof of payment is assured in the event that a deadline is imposed by the Event Administrator. Wood Badge registration is a common example of the importance of this time stamping. When you pay online you will notice that a banking fee charge is added to your total. These are the fees that are usually hidden from you anytime you use your credit card. Merchants usually increase their prices by 5-7% to cover these fees and you never see them, but you can be certain that the banks get their cut of every transaction. While InteliScout enjoys the best possible rating from the credit card companies, the credit crunch of the past few years has still hit InteliScout hard since we are not a huge multi-national conglomerate. So, we have no choice but to pass these fees on to you. Rather than trying to hide these fees from you, we think it better to just tell you up-front what the banks will charge InteliScout for your transaction. InteliScout does not support group members paying for just themselves individually. For this, separate groups are required. However, multiple payments can be made and notes recorded in the database by the group contact person as to who has paid and who has not. When you pay online you will receive email confirmation as a receipt that will carry a transaction number. This number can be used to track the entire transaction for proof of payment. This is all done securely using Authrorize.net to verify your credit card. Important note: InteliScout does not retain any credit card information. We know this is a bit of an inconvenience at times, but not having any banking-sensitive information in our database is probably the best deterrent to attacks from hackers. In over 15 years of operation we have never been hacked, so why tempt fate now? The second method is called manual payment. This option is available unless disabled by the Event Administrator. If enabled, InteliScout will allow you print a completed form that can be sent where directed (usually your council office) along with payment. Once the Event Administrator is notified of your manual payment he will have to manually enter your payment into the InteliScout system. Please note that Event Administrators are often very busy people, and sometimes things get overlooked, so be sure to keep copies of everything on the day of the event to prove that you've paid manually. Other than the banking fees discussed above, InteliScout passes your online payments to wherever dictated by the Event Administrator. This is usually your council office. So, InteliScout's ability to refund your online payments is limited. For some events, the Event Administrator requires that all refunds come directly from the council office since some or all of the fees may not be reimbursed. However, if your transaction is less than 30 days old and the Event Administrator asks uInteliscout to credit your card directly, we will make every attempt to do that. To request a refund you must contact your event administrator. Do not contact Inteliscout directly. Ratings tell others considering attending an event what others think of it. The intent of ratings is simply to give you a forum to voice your opinions of an event. The more stars an event has the more likely it is to be attended by others in the future. Comments on an event can be made as a part of the rating process. You can also see the comments left by others. 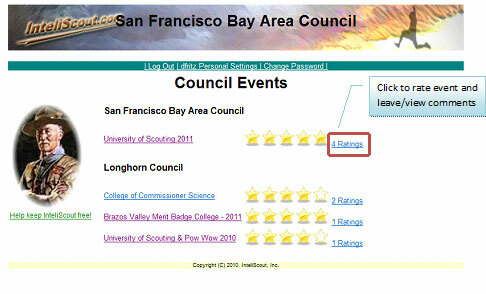 To rate an event click the Ratings link next to the event on the InteliScout Council page. Once you click the Ratings link you will be taken to the Ratings page. 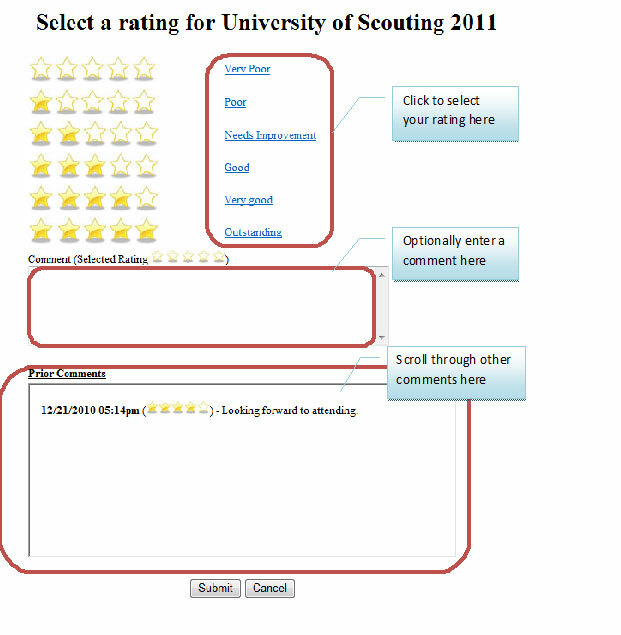 Simply select your rating for the event and optionally enter a comment. You can also view all previous comments posted for this event. NOTE: All comments are anonymous unless you enter your name as part of the comment. 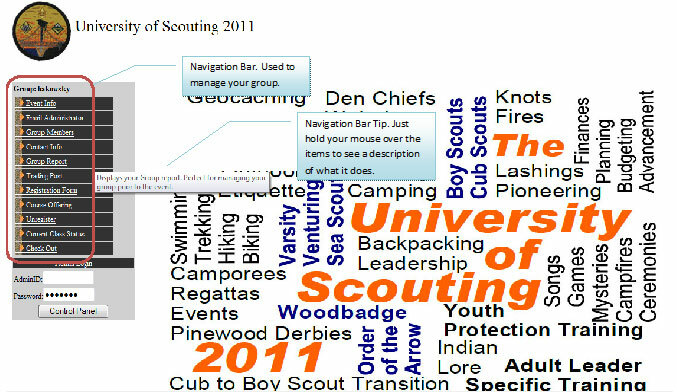 InteliScout users take advantage of its features in preparation for attending an InteliScout hosted event. Some features are common to all event types, while others apply only to more complex events requiring class selection and scheduling. InteliScout provides a great way to learn about events before signing up. Every event has its own information page that tells you about the event including when and where is will be held, who will be coordinating the event and their contact information, and how much it costs to attend the event. More information such as maps, course offerings, and other information are often made available through the event information page so that you can make informed decisions prior to registering for the event. Once a group or a unit is registered the members of the group or unit can be managed by a single contact person (often a scoutmaster or den leader) who keeps the group informed, collects fees and distributes schedules, maps, etc. InteliScout supports a trading post for each event. Through the trading post items such as patches, mugs, t-shirts and optional lunch tickets can be purchased. The items for sale in the trading post for each event is determined by the Event Administrator. Event Administrators have the ability to easily send notifications to participants via email. This feature is often used to send out reminders such as "Do not to park in parking lot C," "Print your final schedule and bring it with you to the event." When you register for an event, watch for emails with subject lines matching event names because they probably contain important information about the event. Each time you enter your event's site you should complete your session by clicking the Check-Out button on the Navigation Bar. This will give you a summary of your group or unit's status and list the actions available to you. Simply select the appropriate action. 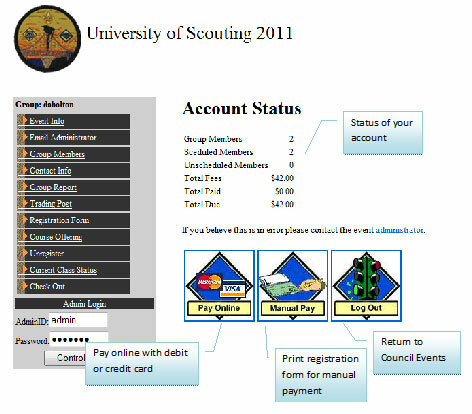 InteliScout allows participants to pay fees online using credit or debit cards. Support for manually paying fees is supported through a form that is generated by the system, printed, then mailed or dropped off at your council office along with payment. Please note that InteliScout only supports payment for entire groups, not individual group members. Typically, the group representative or contact person will collect the fees from group members and make a single payment to InteliScout. Of course, payments by individuals who register themselves is supported. For some events like Philmont, Wood Badge, or Summer Camp, the payments may be large. As a result, partial payments may be made over time. If your event does not support partial payments you should email your Event Administrator asking for this feature to be enabled. Events such as Merit Badge College or Summer Camp for Scouts, and University of Scouting or Commissioner College for adults require that you make your selection from a list of offered courses. It is up to the Event Administrator how you will be assigned a class schedule from the courses selected. The most common method of producing a schedule for an event is by selecting which types of courses or merit badges you want to take. This is done clicking the Group or Unit Members button on the Navigation Bar (see below) then adding the participant or scout using the "Add" toolbar button. Once you see the participant or scout's name click it. 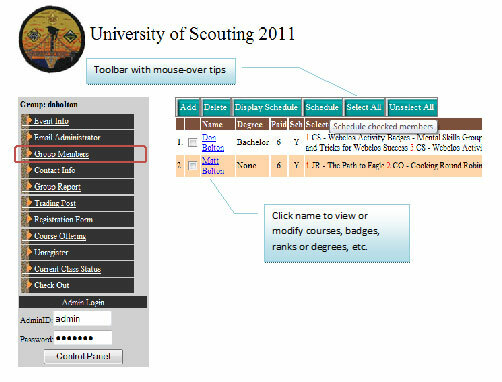 This will open up a window that allows you to select course or merit badge preference and set other type of information such as registration type, degree or rank, etc. Simply click the "Generate Schedule" button schedule the scout or participant. Because many events are large and schedule is complex, most Event Administrators choose to auto schedule each participant once they have selected their preferred classes in prioritized order. If this is the case you will be immediately informed whether which classes you have been scheduled into, and whether all classes are full. This gives you the opportunity to add and remove courses or merit badges to obtain the best schedule possible at that moment in time. If you are a unit or group leader you will repeat this process for each scout or member of your unit or group. InteliScout gives you the option to print your schedule once you are satisfied with your class assignments. If you are a unit or group leader you can print the schedules for everyone in your unit or group at once, with each schedule printed on a different page. To print schedules simply click the "Select All" toolbar button then the "Display Schedule" button. Once the schedules are displayed click the "Print" button at the bottom of the page. You may have to scroll down to see the Print button. For many reasons, it is often necessary to delay final printing of schedules until just before the event. If this is the case then the Event Administrator will enable draft scheduling. If you generate a schedule and it has a "DRAFT" watermark that means that your class locations, instructors, even periods, may change when your final schedule is ready to print. It is important to note that draft schedules are a promise that you will get into the classes shown. However, on some rare occasions, due to unforeseen circumstances such as instructor or room loss, you may be notified by the event administrator that your schedule must be changed. If draft schedules are enabled, you will be directed via email when to print your final schedule. Some events like Summer Camp and Merit Badge College require that each merit badge class be accompanied by a Blue Card. InteliScout allows Blue Cards to be handled completely electronically. Once instructors have completed blue requirements unit leaders will receive an email to print the blue cards for each scout in their unit. Below is a sample of a blue card created automatically based on the instructor's preferences, signed off by the instructor, and printed by the Scoutmaster, all done online using InteliScout.